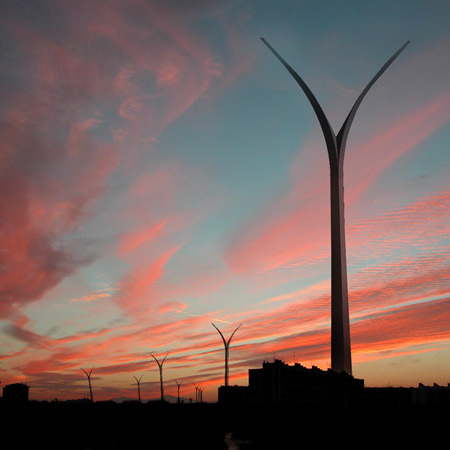 A gallery of designer pylons and a British government pylon competition. 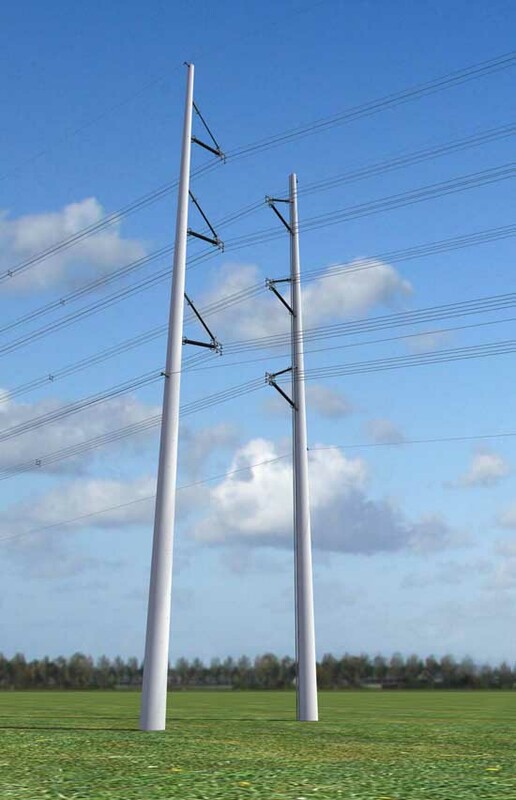 In 2008 I urged the not-yet-elected Obama team to build their promised national electricity grid using decent designs for high-voltage pylons. 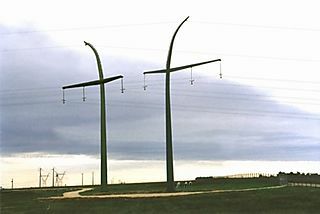 Low-voltage lines can be buried fairly cheaply, but this solution is prohibitively costly for the high-voltage long-distance grid backbones. 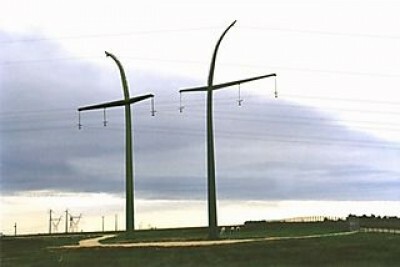 The latest country to have joined this bandwagon of virtue is the UK, which last week announced a competition for new pylon designs. Steven Chu please copy. What’s going on here? (Photo gallery at the end, below the jump.) The National Grid, privatised but a tightly regulated monopoly utility, needs to build lots of new lines to carry wind power from the remote offshore and highland locations where you find it. But land use is one of the few areas where British local government has real powers of veto. Well-organised and experienced NIMBY protesters are adept at playing the system to obstruct large construction projects (see London airports, passim). 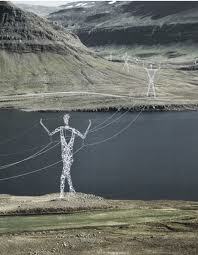 So the Grid need serious political help to get their lines built. Chris Huhne, the Lib Dem energy minister, obviously thinks that the premium for good design is worth paying to dampen NIMBY opposition. This is the democratic political process substituting in a rough-and-ready way for the infeasible Coase market in visual nuisance. That can’t be all. The movement for better pylon design started SFIK in France, where NIMBY protests don’t get far against raison d’Ã©tat. It must be a fortunate internalisation of aesthetic concerns by the engineer-technocrats trained in the Grandes Ecoles. The old, ugly designs come to be seen as kludgy, naff, old hat. I don’t know how much extra you have to pay for changing eyesores into acceptable features of the landscape. Marc Mimram cited the unit cost of his very fancy Roseau design at â‚¬580k, but that’s for a pilot run of under a dozen pylons. Mass production and value engineering will presumably bring this down a lot. I reckon they are good value even at the higher price, a drop in the overall system costs. Images speak louder than words, so here’s a gallery. Roseau is still my favourite. What’s yours? PS: I emailed my original post at the time to the UK Department of Energy, who forwarded it (they replied) to National Grid. You never know. The people-shaped ones are the *worst. * Please, please no!!! They interrupt the landscape in a way the others don’t. I find even the regular ones we have here in Cali to be just fine in terms of shape. Of course, I also think those port lifting machines are beyond cool-looking, so maybe I just have bad taste? Now, changing the paint color is an interesting idea. That blue is too loud. The green was kind of nice. But maybe just industrial grey is good. It’s quiet and doesn’t shout. Zwarts & Jansmas’ has my vote for aesthetics or rather unobtrusiveness. Anitti Nurmesniemi’s looks the most sturdy but I’m no engineer. Very interesting James — though Huhne is clearly not in a position to push through policy at the moment. Keith: is this really a controversial initiative within the coalition? The seriousness of climate change, the need for green energy, and safeguarding the rural environment are consensus positions in British politics. 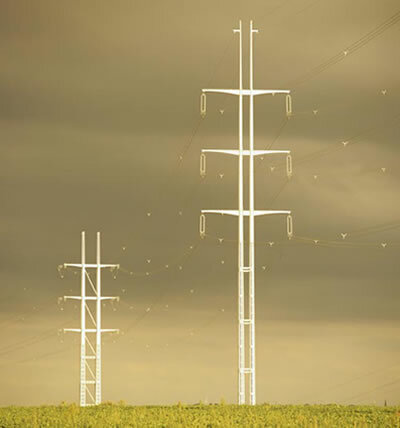 The extra cost of designer pylons – which consumers would pay for through very slightly higher electricity tariffs, not taxpayers – is tiny compared to the costs of new wind and nuclear generating capacity. I don’t see the problem for Huhne. Huhne’s problem is that he is mired in multiple scandals and may be forced to resign. The coalition leadership is in my judgment genuinely green, even a bit more so than the average UK voter. Naturally, the Italians’ are the most elegant. Calatrava had a nice design for a bridge near the Denver Int’l Airport that was shot down due to money. It was not that expensive in the big picture or in the long run, but who looks at the big picture or the long run these days? Better looking infra, aye. Not one penny for quality of life, aye. The Italian design for simple gracefulness, the Dutch one for capacity with simplicity and some elegance, the Icelandic one for whimsy (it might play much better in a landscape that’s mostly human-free, as opposed to the Continentals’ heavily built environments). The French examples strike me as a little busy in the one case and a little outre in the other. The Finnish one doesn’t do much for me compared with current ones here. Of course everyone’s mileage will vary. And esthetics aside, there’s a lot I don’t know about practicalities like the cost of anchoring the single-pole designs and how stable they can be. The Finnish-style design may be best– or even the only feasible one– where you can’t, or don’t want to, drill deep bores and pour big anchors. In rock, for example. I think a lot of this comes from thinking about the esthetic and cost possibilities of reinforced concrete and other materials that are more plastic, or can be used in more interesting ways, than had been the practice. Why imitate the older angular and busy beam-and-lintel lines, with all their cross-bracing, in concrete or steel pipe when you might get something better-looking and more efficient material-wise by letting the materials do what they do, or by echoing Roman arches and curved building shapes, especially now that concrete can be cast in a widening range of shapes? And there may be a maintenance payoff from design simplicity too. The Millau bridge might be a good example of the approach I’d guess would be driving this– though not particularly swoopy, it is dramatic and its spareness is relieved by curved pylons and shaping of the cast road segments. Altoid: The French new design I’ve seen close up (Muguet, photo in earlier post) is constructed out of welded steel; they are basically large shaped pipes. The others look the same, apart from the whimsical Boston-Icelandic variant on current bolted lattice design, and that is the one that isn’t getting built. As for foundations, i trust EDF and counterparts to know what they are doing. The one line where Roseau is installed crosses the Somme near Amiens, so the foundations must be pilings sunk in mud. The wind resistance of a smooth steel cylinder must be pretty low – possibly better than a lattice. I would guess they are less prone to buildups of ice. Calling any engineers out there? James: Was just more or less thinking out loud about where the different types of designs are located. The Finnish pylons look like a much cleaner version of what we usually see here rather than the re-thinking some of the other ones show. As nice as they look, though, I couldn’t help thinking that the single-pole designs, or the ones with a very small footprint, would only be reasonable where it’s easy to dig fairly deep holes. But if we think about the kind of terrain that’s in, say, northern Ontario or Finland, or even in most of PA where I am, or much of the western third of the US, it’s a different story– you don’t have to go far down to hit solid rock, and I’d have to think it would be prohibitive to bore big holes in that. 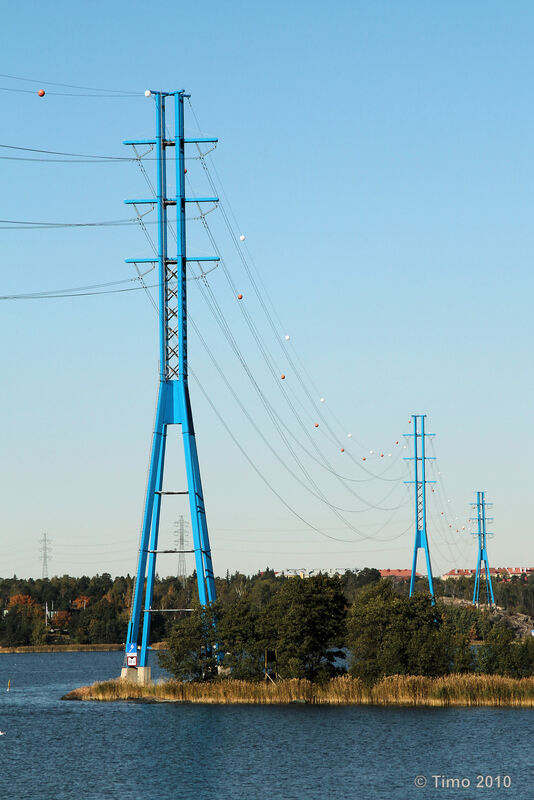 So the pylons would need three or four legs on a fairly wide base, which in fact is what the Finnish ones are like. A lot of Europe has a lot of rock under it, so they’d surely need several designs. And your original point is right; there’s no reason they shouldn’t look nicer than they traditionally do. I doubt if any design can be completely proof against truly extreme weather events. An irrelevant but nice anecdote: when tropical storm Lothar hit France just after Christmas 1999, large parts of the grid in SW France were down. I was living in Strasbourg at the time, and recall newspaper reports that the next day many retired linesmen showed up without being asked to help with the repairs. They knew that fixing 400kv lines is not work you can entrust to enthusiastic amateurs. It’s quite true that EDF emploees are featherbedded with a super-generous pension scheme and lots of other perks. They also, like French railwaymen abd European civil servants, have a genuine ethos of public service.